Earlier today, Microsoft released three new updates to Insiders on the Windows 10 Fast Ring, fixing issues and addresses vulnerabilities on the Windows 10 Preview build 10041 release. Now Microsoft has also started rolling out an updated version of the same build to Insiders signed up for the Slow Ring. This new build comes with all the new features, UI improvements, performance tweaks introduced in build 10041 along with the fixes for some issues experienced in Fast Ring. As you may know the Windows 10 update is offered in two forms to Insiders - The Slow Ring offers more polished and stable versions of Windows 10 preview, while the Fast Ring offers slightly newer builds which are more prone to bugs. Unless you are looking for frequent updates, more prone to breaking your system, you are recommended to run the Slow Ring. 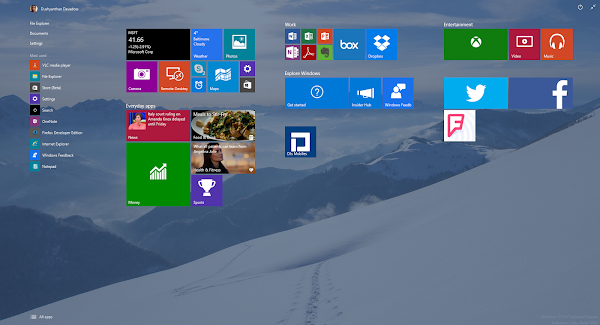 Be sure to check out all the new features on Windows 10 build 10041 along with the known issues with the update. Windows 10 will be released sometime this summer for PCs, laptops, tablets and phones. Besides releasing Windows 10 build 10041 for Slow Ring users, Microsoft has also released the official ISO files for the same build. You can use these ISO files to perform a clean installation of the latest Windows 10 Preview release. You can also use the ISO files to install Windows 10 on a virtual machine. The Windows 10 ISO images of the March Update (build 10041 ) are available to download directly from the Windows Technical Preview website. The ISO files are available in both x86 and x64 flavor in English (US & UK), and other languages.